The global petrochemical industry is estimated to reach USD 758.3 billion by 2022, according to a report by Grand View Research, Inc. If you are a marketer looking for business opportunities in the petrochemical industry, Blue Mail Media’ s Petrochemical Industry Email Database can help you expand your reach to key decision makers, top level executives and professionals in the industry. Blue Mail Media’s database has been designed to be highly accurate and reliable and it powers marketers with crucial information to connect with their target prospects via telephone, email or mail. The quality of your data determines the success of your marketing initiatives. Blue Mail Media follows a stringent process of data collection, verification and update to make sure our Petrochemicals Industry Email List remains highly accurate and reliable. We also recognize the fact that your data requirements and your marketing objectives might be different than others, and thus, we offer our clients to choose from our pre-packaged list of Petrochemical Industry Executives or get a customized list prepared based on their marketing specific objectives. Blue Mail Media has positioned itself to be among the top database vendors around the world with its data partners spread across different regions such as the UK, US, North America, China, Russia, Australia, India, Canada, New Zealand and more. 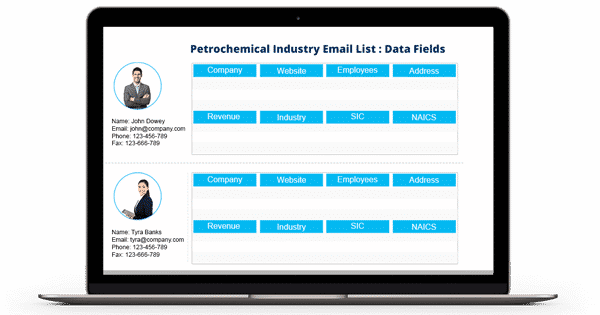 Our team of data specialists, marketing experts, and professionals leave no stone unturned in making sure our Petrochemicals Executives Mailing List helps you attain a high response rate, greater conversions, and more ROI.